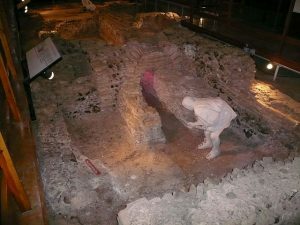 Have you ever wondered what the Roman Baths looked like? Then you have your chance by visiting the Welwyn Roman Baths. You can find the baths north of Welwyn Garden City, Hertfordshire. The baths date back to the 3rd century AD and at one time were a part of the Dicket Mead villa. The excavation of the Dicket Mead villa was never complete d due to the laying of a motorway. As the story goes, the village was actually a Roman and British settlement. It is known that the baths were only part of original buildings that were part of the villa. It is believed there were four parts, so the other three are under the motorway. In most cases, it is believed it was at one time a farm, but others believe it was a hotel as it is home close to roads. In 1960, the ruins were discovered by Tony Rook, a local archaeologist and the uncovering process took close to ten years to complete. After the excavation, the announcement of the motorway was proclaimed by the Ministry of Transport, which was right on top of the project of excavation. It took a while, but finally, a vault created from steel was created over the baths so the public could see the baths after going through the tunnel. The problem is that due to the motorway, the only part of the baths that are visible to the public is about half of what was excavated. There are all sorts of room to visit: The cold room, called frigidarium, the warm room, known as the tepidarium, the hot room, called caldarium, and the hypocaust that was built from opus signinum. Visitors are allowed to view the baths every day from 14:00 to dusk but they are closed during bank holidays. Adults will need to pay a small fee but entry for children is free.